I always like maps, especially the ones inside the cover of hardback books. Those give me an introduction to the world of the book and give men a sense of "Yeah, I think I would like to explore this place." There'd also be a plethora of highly evolved wildlife ready to smite you should you stray into the bush. Drop Bears have claimed countless unsuspecting tourists down here. As has the heavy-handed and incorrect application of vegemite. I know this is an old topic, but since I'm new here I'm taking the opportunity to sound off. I LOVE maps in fantasy novels; almost as much as I love them in the RPGs I used to play. Nothing is more exciting than looking at a detailed map and imagining a new world. 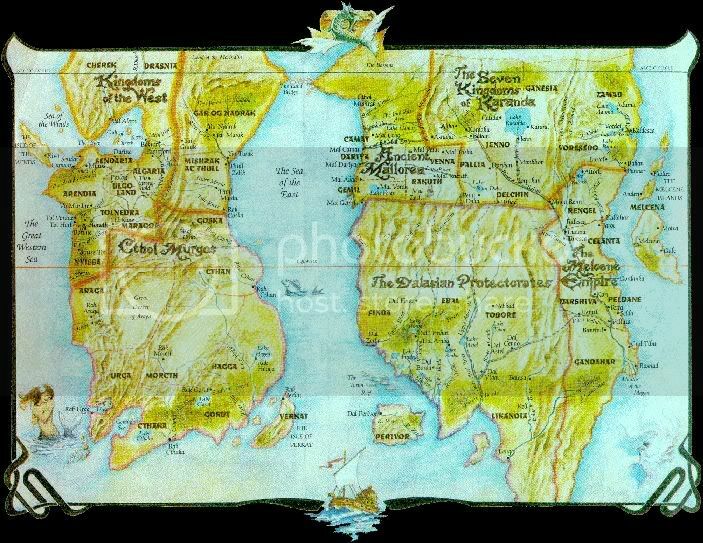 In fact, I think maps add a level of authenticity to the world that makes it feel lived in. I came to this conclusion recently in one of those exceptions that prove the rule situations while reading the Traveler's Gate trilogy. While I enjoyed the story, the map left me underwhelmed because it only had like four locations on it. True the characters could travel to anywhere rather quickly (mostly), which downplayed the questing need to move through a myriad of new locations; but looking at that rather simple map made the world seem a bit flatter to me. True the characters could travel to anywhere rather quickly (mostly), which downplayed the questing need to move through a myriad of new locations; but looking at that rather simple map made the world seem a bit flatter to me. In retrospect, I don't know why I didn't go for the punchline: Worlds, like real women, should have curves. Guess that goes to show why you should never post after a few drinks. So for those of you who watch Game of Thrones and say they don't like maps, does the map during the introduction help you get a sense of proportion to the lands? I received as a gift the maps of Games of Thrones ("Lands of Fire and Ice" ) which is very cool and which I take out and reference frequently while reading (I'm on book 4) or watching. Big fan of maps. It won't prevent me from reading a book/series, but I massively appreciate one. It can be nice to have one to reference back to while reading the story. A lot of places with fantasy names and it can be easy to forget where cities are in relation to each other. It helps with my visualization and gives me an easier understanding of the mechanics of what's going on (in terms of armies/enemies being at a, b, c, etc and stuff). I do think maps are starting to feel a bit samey. I am someone who spends a while studying the map before reading. But it would be nice to see something different. I think this may be down to draftsmanship and author blinkers. Give the author a pencil and they'll draw place names and show outlines, reserving their detail for the areas that matter the most to their story. I am in the camp that always checks out the map when opening a new book. I find though that the vast majority are simple black and white, just the outline of things. I kept feeling disappointed by this that I made it a point to have a professional make the map for my writing - I wanted it to look like a map actually in use by the inhabitants of this world, not just something purely functional mucked up for the reader's sake. I agree with Charles above, an actual cartographer is worth it for their ability to see the potential in crude outlines. I even put up links to download the maps in high resolution on my website. I think it's a good way to make your world stand out and offer something unique to those readers that really care about this aspect, which from this thread looks to be a decent number. Where's your website? I'd like to check your map out. Ah, I forgot to make a signature on this forum. Here's a direct link to the page with the map. It is not the most functional map out there, but I hope it conveys the sense of being a genuine map. I'm generally not much bothered by maps - unless there's a lot of travelling and it helps to know where everything is, to make sense of the story. The exception is the map in Diana Wynne Jones' Tough Guide to Fantasyland, which was brilliant. Wow, that is a world authenticity that's born out of detail. I was just scanning through your site and when I came to the ancient history of the world I had to bookmark it so I could come back and give it the attention it deserves. Kudos, sir. I'm very glad to hear that! I was hoping to elicit such a reaction. I haven't really heard any feedback about those aspects of the site, so feel free to let me know what you think. I like a good fantasy map, for an RPG or a novel. They aren't always needed in some novels. As far as mapping programs go, I still think that the old Fractal Mapper by NBOS is quite excellent. It does everything I want it to, and produces great maps once you learn how to use it. There is a bit of a learning curve, as with all things. I think my favorite part of your site by far were the quotes, with this gem"The best fantasy book ever written. --The author." My mock blurbs include "A book with words and sometimes sentences," and "The best book I've read this year. --No one." But, since this thread is about maps, I'll try and drag us back to that topic. I note in your novel you credit a cartographer. Do you know what program s/he used? I note in your novel you credit a cartographer. Do you know what program s/he used? Ah, I'm sorry, I have no idea. I checked his site, but couldn't find mention of any programme. You'll have to ask him directly. PS: Glad you liked the 'quotes'! Your last one was very good too! That's a great site, Tanniel. It shows you put a lot of thought and effort in your work. I've created a thread here in which our forum's sulf published authors like you, @ABatch, @Anti_Quated, @Nuomer1 etc (all of whom have their own websites I believe) can post your sites and discuss them. Potentially interesting thread there - let's see how it goes. As for maps - they are mentioned in my reply to that new thread. I'm beginning The Darkness That Comes Before and I'm using the map, an enlargement of which I found on the net, almost every page as the places are mentioned. I can't imagine reading this without a map. Resurrecting this old thread with a link to the guy who made the map for The Emperor's Edge. Nothing too mind blowing, but still interesting to see the process. He used Photoshop and it apparently has/ had a lot more options than the program I used (AutoREALM) to make mine.